It was a fitting tribute as she nears her retirement that Mosaic Clubhouse’s dynamic Chief Executive Maresa Ness was honoured for ‘Going the Extra Mile’ in NHS Lambeth Clinical Commissioning Group’s (CCG) 2018 Lammy Awards on September 5. Equally moving was the presentation of the Lifetime Achievement Award to Mick Collins (pictured above left) who retired this year as Borough Lead, Lambeth Addictions consortium and consultant Mike Kelleher (third left with nominator Councillor Ed Davie) for their ‘extraordinary contribution’ to Lambeth’s addiction services. Mike Kelleher paid homage to Mick’s 30 years as a “tireless champion” who “strongly embodied the service user voice” for those dependant or addicted to alcohol and drugs. He described, “a series of epiphanies” following the duo’s meeting in 2003, and praised the vision of those including GP Adrian McLaughlin and commissioners Denis O’Rourke and Kenny Gregory to shape the Lambeth Addictions Consortium that emerged in 2010, see link below. A packed Lammy awards ceremony at the Kia Oval heard how Maresa, the first mental health service user to train as a nurse at the South London & Maudsley NHS Foundation Trust (SLaM) went on to manage a hospital. Inspired by the Mosaic clubhouse model in New York, Maresa set up a clubhouse in a single room in Streatham. It offered people living with mental illness opportunities for friendship, employment, housing, education and access to medical and psychiatric services in a single caring and safe environment – the aim – so they can recover and fully participate and be respected members of society. The nomination highlighted that over the years Maresa has fought to keep this amazing service going. Mosaic has been, for 24 years, a place for building people’s confidence so that they can realise their own potential. It is Maresa’s determination and belief in the model that has made Mosaic a benchmark for future clubhouses around the world. Maresa (pictured second right) was presented with the award by Lambeth’s mayor Christopher Wellbelove who has made Mosaic his official charity. Recently the Clubhouse was awarded £266.881 by the Big Lottery Fund . Maresa was clearly really moved by the Lammy and said she “wasn’t expecting to hear the words in the citation from (Mosaic Clubhouse) members… “it meant so much to me coming from members and Bev (Programme Manager) . “They hadn’t told me they had submitted,” she added. 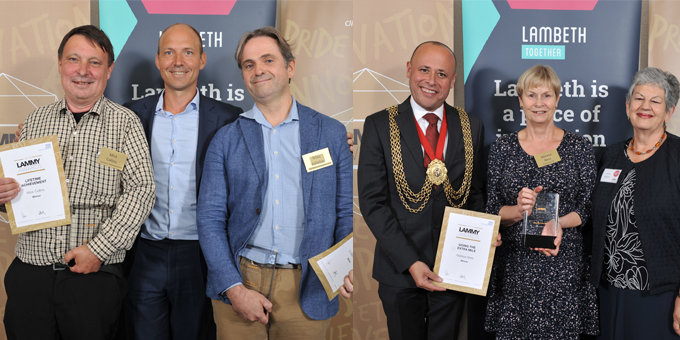 Another winner ‘Going the Extra Mile’, was Jason Henley from the Black Prince Trust, Kennington, whose ‘can-do attitude’ has led to partnerships with the North Lambeth Local Care Network to enrich the lives and health of the local community. Nominated by North LCN Chair Jane Stopher, Jason had linked in at Lambeth Walk and Vauxhall GP surgeries supporting patient’s options to become healthy and sharing how the Trust’s free activities can help. Jason said, “we take community activity and making the community healthier very seriously, we have a strategy in place that focuses on key areas around the community leading a healthier life and at The Hub we offer the community the tools to do so. The support from the LCN members has been great and we will continue to offer the community different ways to sustain an active and healthy life”. Mental Health featured strongly in this the Lammy’s fourth year. Christopher Shoulder, Peer Recovery Officer, PICuP Clinic (SLaM) took the Putting Patients First Award for healthcare professionals. Meanwhile, The Maudsley Simulation Team were rewarded for Innovation in Lambeth – Congratulations to Ursula Joy, peer support stalwart and runner up for Project Dare. There was a roar of approval for People’s Award winners Care4Carers, Paula Bryan and Bobbie Allan whose input into building capacity and confidence for carers to have a life of their own while supporting loved ones was heralded.